The angle of repose is the minimum angle at which any piled-up bulky or loose material will stand without falling downhill. One way to demonstrate this would be to pour sand from a bag to the ground. 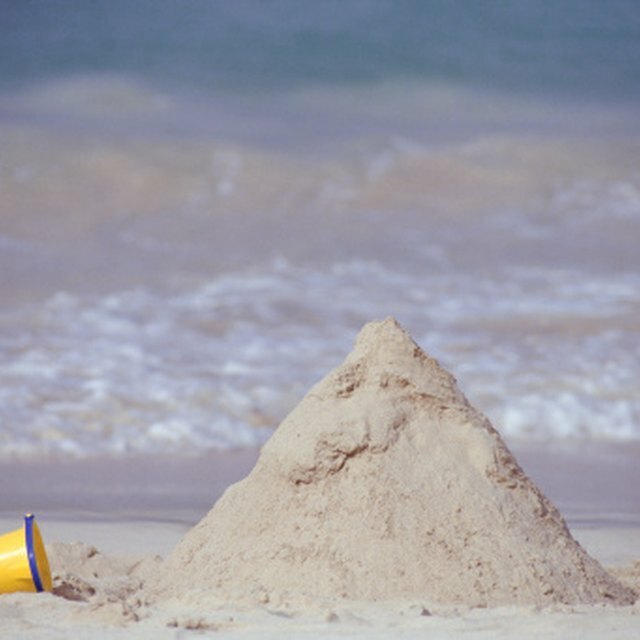 There is a minimum angle or maximum slope the sand will maintain due to the forces of gravity and the effect of friction between the particles of sand. The angle is calculated between the peak of the pile and the horizontal ground. The angle of repose for dry sand has been calculated to be 35 degrees, whereas cement has an angle of repose of 20 degrees. Pour the dry sand into a pile on a level surface allowing it to build a pile from the top. This will result in a pile with a relatively circular base, making measurement easier. The equation for calculating the angle of repose is: tan-1(2h/d). Using your scientific calculator, multiply height by 2 and divide this value by the distance. Then, hit the inverse tan key (or tan-1) and the answer just calculated. This will give you the angle of repose, &alpha;. Place the protractor on the level surface next to the pile of sand. Using the ruler, create a straight line from the peak of the sand pile down the slope. Read the angle of repose valueand write the value on the paper. Compare the calculated angle of repose from Step 4 and the measured angle of repose from Step 5. If the values are not within 1 degree of each other, repeat Step 5. Bags of dry sand can be heavy (30-50 lbs). Use caution when lifting and pouring sand. Baer, Brian. "How to Calculate the Angle of Repose." Sciencing, https://sciencing.com/calculate-angle-repose-6712029.html. 30 April 2018.